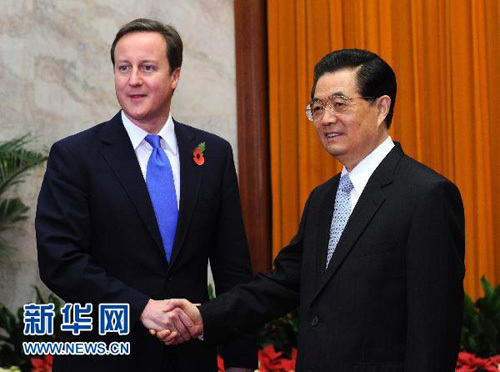 On the morning of November 10, 2010, Chinese President Hu Jintao met with British Prime Minister David Cameron at the Great Hall of the People. Saying that China and Britain are important strategic partners, Hu noted China attaches importance to developing ties with the UK. He said currently the world political and economic patterns are undergoing new changes and global challenges have become more prominent. In the new situation, China and Britain should make planning for bilateral ties from a global and strategic perspective in the 21st century and focus efforts in the following three aspects. First, Hu urged the two countries to make good use of each other's development opportunities. China and Britain are at different development stages. Hu said that cooperation was stronger than competition and opportunities outweigh challenges as the two economies were highly complementary to each other. Both sides should translate into action their strong aspiration to cooperate, identify new growth points of cooperation and enhance collaboration in new energy, new material, energy conservation, environmental protection and high-end manufacturing for common development. Second, Hu urged both sides to strengthen cooperation in international affairs. "As both sides share similar positions and many consensuses on opposition to protectionism, the advancement of the Doha round of trade talks and the establishment of a new international financial order, we should strengthen communication and coordination," Hu said. Both sides should speak with one voice to the outside world and push for the establishment of a sound international trade environment and a rational international financial order. Third, Hu suggested both sides enhance the level of political mutual trust. Both sides should always strengthen mutual understanding, deepen strategic trust and properly handle sensitive issues in bilateral ties based on the principle of mutual respect and through exchanges of high-level visits, strategic dialogue and other mechanisms, so as to push China-UK relations to always develop in a right direction. Cameron fully agreed to President Hu's important proposals on furthering bilateral ties. The British government highly values its cooperation with China, said Cameron, adding that Britain hopes to further advance strategic partnership with China. Both sides should respect their respective development paths, carry out high-level dialogue between the two countries and conduct communication and exchanges on a wide range of topics to build up political trust. UK-China relationship is based on common interests of both sides. As the two economies are highly complementary to each other, their trade and two-way investment enjoy great opportunities. He suggested the two sides carry out mutually beneficial and win-win economic and trade cooperation and expand cooperation in such areas as energy, environment and pharmaceutics. Cameron hailed the sound cooperation between both sides in international issues. He said the UK side is ready to work with China to fight against protectionism and push forward the Doha round of talks. The two leaders also exchanged views on the upcoming G20 summit in Seoul as well as international and regional issues of common concern.